PTFE Non-Stick Coating on Bakery Tray is highly appreciated for its features like long functional life, highly efficient and durable. They are coated with PTFE to provide a non-stick surface to the bakeware. They are available in various dimensions according to the specifications of the clients. We manufacture this product using superior quality materials. They are produced according to the international standards. Thanavala Enterprise, is established in 1980 and engaged in manufacturing, wholesaling, trading, service providing and supplying of PTFE Coatings And Products. It is an Indian company, which is reputed for manufacturing and supplying PTFE Coating and trading the product to many foreign companies. The company is having an latest coating plant for application of PTFE coating. PTFE coating is being done by using the most up-to-date and modern machinery and employing latest technology. The entire job is being done by team of dedicated workers supervised by the most competent experts in the field. We give 100% job satisfaction and have served to customers within India and several overseas countries. 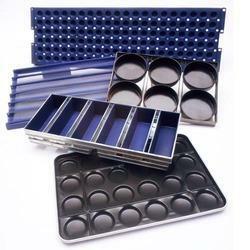 Our range includes industrial molds, bakery trays, shoe molds, chemical vessels, aerospace coatings, automotive springs, textile cylinder, automotive gratings, commercial bakery trays, capacitor tray, nut bolts, cartridge cases etc.